Gladwell’s review rightly points out that the cost of distribution going to free does not mean that there is no cost in the production of goods. So what happens when you follow that thought to its conclusion? This week’s Virginia Glee Club history post comes a little late, but better late than never because it sheds light on an interesting chapter of the Club’s history—its apparent, and apparently intermittent, disappearance in the years between 1905 and 1915. Thanks to a new item that has turned up in Google Books, and which I finally got a photocopy of today, I think we can piece together a fairly decent timeline. …no play was offered in 1910-11. This fact led to the revival of the Glee Club, an association which had disbanded in 1905. A mass-meeting of all the students interested in music was held; a new vocal and instrumental club organized; and rehearsals at once began. This club was composed of twenty members. It gave two concerts in Cabell Hall and four beyond the precincts. Choruses, quartets, and vocal and instrumental solos, were skilfully rendered. This association failed to re-form in 1912-13 and 1913-14, as the result of the absence of an experienced and attentive director and manager. We know that the group was still active in the fall of 1905. A letter written on October 29, 1905 by Sue Whitmore, the mother of a University of Virginia student, mentions her enjoyment of hearing the Glee Club perform. We also know that the Club was around in January 1914, from photographic evidence (above). Then, in 1915, the group was “reorganized” and “trained scientifically” by Professor A. L. Hall-Quest. But what happened to the group between 1905 and 1914? What did Bruce mean that it “failed to reform”? He laid its failure to succeed on poor leadership, but on what evidence? Here’s where the new discovery sheds some light. We, the officers of the University of Virginia Glee Club, in consideration of the disadvantageous circumstances under which the afore-mentioned club has operated within the past three years, do officially declare said club disbanded, believing that by so doing an ultimate success may be achieved along another line. (Signed): Roger M. Bone, president, Robert V. Funsten, vice-president, Vaughan Camp, secretary, C.A. McKean, treasurer. In late 1905 or maybe early 1906, the Glee Club disbands. In 1910, the Club reforms, responding to a musical vacuum left by the demise of the Arcadians, a musical theatre group, and struggles for a few years with inexperienced musical and logistical leadership. At the beginning of the third season, in October 1912, the officers of the time disband the group temporarily. 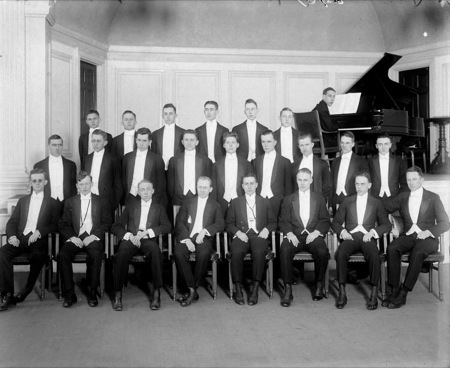 At the beginning of the fall 1913 semester, the group re-forms (though the photo is dated January 1914, the re-formation must have happened in the fall—the odds of getting so many young men into matching suits for an official portrait in less than a month are probably no better then than they are today). In 1915, the students connect with a professor, A. L. Hall-Quest, who has connections to the Princeton Glee Club tradition and who sets them on a sturdier footing. Bruce overstated the hiatus by a year, based on the photographic evidence, but otherwise he was right on. The timeline speaks of an organization that was making it, or not, year-to-year, with little to no institutional support. That sort of existence resonates with my memory of the group between 1990 and 1994, with one difference: we had alumni who cared about the group enough to keep it afloat, and the Club guys of the early 20th century did not. There wasn’t a real alumni association, to speak of, until the first World War. The next question, which will have to wait for another post, is: what happened after Hall-Quest left? He resigned in 1918, and Arthur Fickénscher didn’t take his job at UVa, and the directorship of the group, until sometime in the 1920s. But this answer might have to wait until I can get back to Charlottesville to do some real research.